Despite his name and his French training, Charles Elmé Francatelli was English by nationality. He wrote several important cookbooks, and held in succession three of the most prestigious cooking positions in England at the time. Francatelli was born in London in 1805, but grew up in France. There, he learnt cooking, getting a diploma from the Parisian College of Cooking, and working under people such as Carême. Upon his return to England, he worked for various places such as Rossie Priory and Chesterfield House as “chef de cuisine” for the Earl of Chesterfield, at Chislehurst in Kent for Sir Herbert Jenner-Fust, at the Coventry House Club, and cooked for the Earl of Errol. 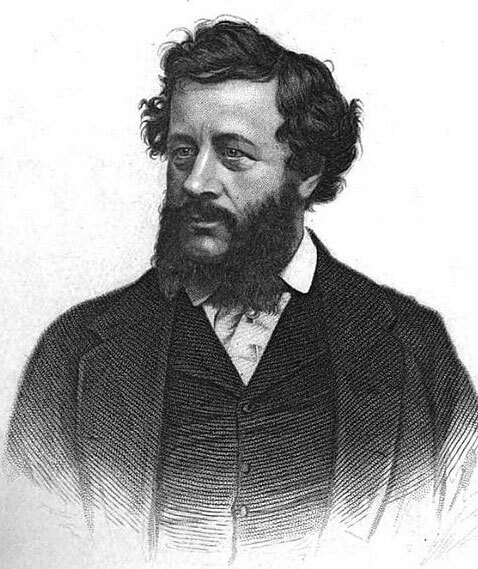 By 4 February 1839, he was working as chef at Crockford’s Club in London, taking over from its previous chef Louis Eustache Ude, who had just quit in a salary dispute at the start of February (Disraeli didn’t think much of Francatelli’s chances at following in Ude’s footsteps, but time was to prove him wrong.) He didn’t stay at Crawford’s long, though: by 1840 or 1841, he started work for Queen Victoria as maitre d’hotel and “chief cook in ordinary” at Windsor and stayed there for four years. In 1845, he published his book “The Modern Cook.” in England, and in America in the following year. The book sold well on both sides of the Atlantic. In it, he advocated two courses for meals — a savoury followed by dessert, which is how most everyday eating is done now. In 1850, he then became chef at the Reform Club, taking over from Alexis Benoit Soyer, who had resigned in May of that year. Francatelli worked there for seven years. In 1852, he got the food company Brown and Polson to be a sponsor of his book, “A Plain Cookery-Book for the Working Classes.” In return, he gave Brown and Polson space for a large advertisement at the back of the book, and mentioned their products by name in several of his recipes. His last job was at the Freemasons’ Tavern in London. A younger cousin of his, whom he never met, Laura Mabel Francatelli (c. 1880 or 1881 – 2 June 1967), survived the Titanic. She was travelling as secretary to Lady (Lucy) Duff-Gordon, a fashion designer at the time, who also used a sister of Laura, Phyllis Francatelli, as a model. 1861. Cook’s Guide and Housekeeper’s Butler’s Assistant. London: Richard Bentley and Son. 1862. The Royal English and Foreign Confectioner. London: Chapman and Hall. Liebig’s Extract of Meat company carried a posthumous endorsement from him in an 1889 brochure the company put out, quoting him as saying “The very soul of cookery is the stockpot and the finest stockpot is LIEBIG COMPANY’S EXTRACT of MEAT”. The brochure attributed the quote to “Francatelli, Chef de cuisine of the late Emperor of the French”. After Napoleon III was deposed, he and his wife Eugenie lived in England. He died at Chislehurst on 9 January 1873. It may have been while at Chiselhurst that Francatelli cooked for him, or perhaps, during Napoleon’s much earlier stay in England between 1838 and 1839 at the Royal Leamington Spa in London, he happened to dine at Crawford’s where Francatelli worked at the time. In either event, to have said that Francatelli was “chef de cuisine” for Napoleon would have been advertising hyperbole at its best. “Over the mantelpiece was … a large framed photograph of Francatelli, that immortal chef whose memory is kept green in so many kitchens, and whose recipes are still followed as are followed the footprints of the great ones in the Everlasting Sands of Time.” — from Hichens, Robert Smythe (English author. 14 November 1864 — 20 July 1950). The Prophet of Berkeley Square. Chapter 9. 1901. “The palate is as capable and almost as worthy of cultivation as the eye and ear.” — Francatelli. “I wish you were as gourmand as I am; I wish you could have had some of the delicious white soup I made, or rather caused to be made for the club last week. I shall not tell you anything about it, I’m sure I should not make your mouth water if I did. I believe you could read Francatelli right through from beginning to end without being moved in the smallest degree.” — Miss Eliza Mary Ann Savage (1836 – February 1885) in a letter to Samuel Butler (1835 – 1902). January 1877. “What a failure that special grand dinner was! How those dreadful occasional waiters did break the old china! What a dismal hash poor Mary, the cook, made of the French dish which she WOULD try out of Francatelli!” — William Makepeace Thackeray (English author, 1811 — 1863). Roundabout Papers. Published 1860 to 1863.